Sign up for a FREE trial below to get started with creating and managing your RSS. Create RSS Feed. Manage with Ease. 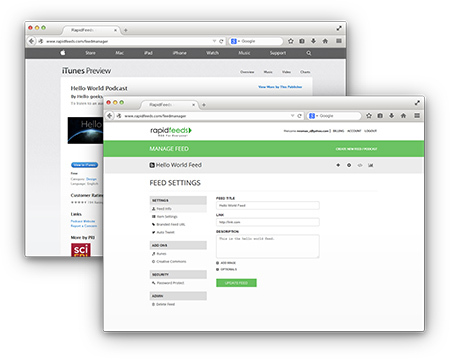 Whether you are using RSS to broadcast your content to your users, or keeping your team up to date with internal news; you’ll find RapidFeeds’ FeedManager to be the best assistant you can have to take care of all your RSS feeds creation and management needs. You have a great podcast recording software, but are struggling with RSS to broadcast it? Create a podcasting feed and power it up with complete iTunes support, all with a simple online form. Quick and Easy! Use your own domain for your RSS feed URL. Virtually serves your feeds from your own domain to enhance your brand experience for your users. Quick and Easy setup. Track RSS feed performance with smart metrics for your RSS feeds including daily and montlhy stats, Geographical distribution, User-Agent stats, Item Click-Through details and more! Automate Twitter Timeline posting to reflect your RSS Feed updates. With this one-time, one-click setup your Twitter Timeline is updated instantly everytime you add a new item or podcast to your RSS Feeds. Automate RSS Feed publishing by scheduling RSS Feed updates - in your own Time Zone. With a single click! 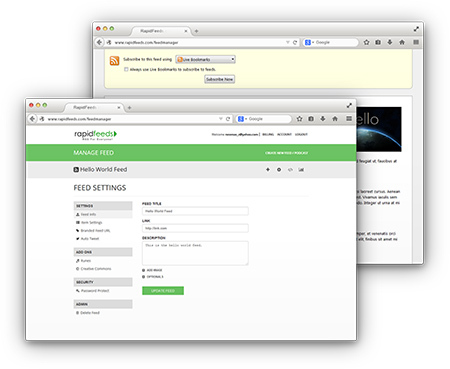 Secure your private and commercial RSS Feeds with a password, instantly. All free trial are for a duration of 14 days. No Credit Card Required. No, you can sign up for a 14-day free trial. And choose a plan when you are ready before it ends. No. You do not need a credit card to sign up for a trial. You will only need it while upgrading. What happens if I do not upgrade after the trial? If you do not feel RapidFeeds is the right software for you, you can simply stop using it. Your account will automatically get deactivated at the end of the trial. But your data will be safe and you can access it if you choose to upgrade anytime in the future. Absolutely. You can switch between our Basic, Professional and Enterprise plans at any point without any hassle. With priority support, your support requests go to the top of the queue for our team of support champs to look into and resolve your issue.